A selection of Dolomite's microfluidic chips are optimized for various types of reagent handling in biomedical applications. Microfluidic devices have long been a staple in research settings for performing a variety of cell manipulation applications or for determining such material characteristics as viscosity, pH, and chemical binding coefficients. However, university research groups and companies alike are struggling to adapt microfluidic technology to portable diagnostic devices. Featuring one or more channels containing at least one dimension less than 1 mm in width, microfluidic products are used to move common fluids such as whole blood samples, bacterial cell suspensions, protein or antibody solutions, and various buffers. Their advantages are manifold. Because the volumes of fluids within microfluidic channels are generally in the nanoliter range, this technology minimizes the accompanying use of reagents and analytes—substances or chemical constituents that are determined in analytical procedures. 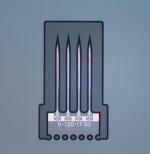 In addition, microfluidic devices can be fabricated using relatively inexpensive production techniques capable of producing elaborate, multiplexed devices. Finally, microfluidic technologies enable the fabrication of highly integrated devices that can perform several different functions on the same substrate chip. Microfluidics is a mature technology, but its use in medical applications is still evolving. Thus, while the development of microfluidics for point-of-care diagnostics remains a work in progress, new and promising approaches are in sight. Among the research groups working to transform microfluidics into a core technology for point-of-care portable devices is the Center for Microfluidics and Medical Diagnostics at the University of Notre Dame (Notre Dame, IN), headed by engineering professor Hsueh-Chia Chang. “Microfluidics is particularly useful for global health and epidemic control because it offers portable diagnostic kits,” Chang comments. “These kits may not have the sensitivity of a lab-bound device, but they could be carried around in the field and could be used by nonprofessional personnel.” The team believes that the chip could aid in controlling such infectious diseases as tuberculosis, malaria, and AIDS in the Third World. The group's nanosensor-based microfluidic chips feature hard-polymer substrates that contain embedded microelectrodes fabricated using standard microcircuit manufacturing methods. The technology employs ac electric fields to separate, concentrate, and detect molecules such as DNA, RNA, and peptide biomarkers on the chip. “Our chip technology is suitable for global health and epidemic control applications because it does not require laboratory-based fluorescent labeling or optical detection techniques,” Chang says. While early microfluidic prototypes were based on silicon and glass, the UW group is working on a technology that is based almost entirely on polymeric laminate technology. The team has experimented with nitrocellulose membranes and a variety of other materials for the primary liquid movement, but its current focus is the use of polymethylmethacrylate and Mylar for the contacting material, which is held together using pressure-sensitive adhesives. These technologies form the basis of what the research group calls the Dx Box, a microfluidic device designed to work with plastic cartridges for performing aminoassays and nucleic acid amplification assays. Like Chang’s group at the Center for Microfluidics and Medical Diagnostics, Yager 's team is also concerned with optimizing fluid movement in microfluidic devices. “We achieve fluid movement using two pressures and a vacuum generated by small quarter-bolt vacuum and pressure pumps,” he explains. Like other microfluidic devices, the UW group’s device incorporates valves that rely on an external power source. However, the researchers are trying to transcend the need for external power, enabling the fabrication of a completely disposable chip that needs nothing more than a piece of commonly available technology to make it fully capable of performing quantitative measurements. Although many universities are engaged in microfluidic research, manufacturers such as Dolomite Microfluidics (Royston, UK) are turning research into reality. Dolomite’s chips are used in point-of-care applications such as drug-delivery and clinical diagnostic devices, but the company is also interested in developing chips for devices that perform therapeutic effects similar to dialysis. Micronit's glass microneedle arrays have locally insulated electrodes for neural signal recording and stimulation. Equipped with needles up to 7.5 mm long, this array has a cross-section measuring 200 to 300 × 100 ?m. Many of Dolomite’s chips have edge connections; instead of containing a hole in the surface for fluid inlets and outlets, the chip has channels that are fabricated right to the chip’s edge. This configuration is advantageous because it can help to reduce costs by eliminating the need to create holes at right angles to the channel direction. It can also reduce the shear stress on the fluid, which could be useful for handling such fluids as blood. In addition, edge connections enable the company’s chip designers to make straightforward connections to multiple channels simultaneously. Scientists and manufacturers are interested in microfluidics because it consumes small quantities of fluids and can be automated, reducing test costs. It also enables the analysis of tiny samples, allowing tests to be performed with the same or less fluid than other diagnostic methods. In addition, it offers rapid analysis times, improved data quality, multiparameter testing, and reliable parameter control. Capitalizing on these features, Micronit Microfluidics (Enschede, Netherlands) designs microfluidic products for portable medical devices that can perform near-patient testing. The company’s chips, explains Harmen Lelivelt, manager of marketing and sales, are constructed from layers of glass. Each layer has channels, holes, or electrodes, or a combination of all three. Fabricated using lithographic techniques borrowed from the semiconductor industry, these microfluidic chips are made on 4- to 6-in. wafers and have features that typically range in size from 5 to 500 µm. Such minuscule features are made using chemical wet etching, micropowder blasting, or metal deposition techniques. Measuring less the 1 cm2, Micronit’s chips are designed for one-time use, eliminating the need for cleaning and the risk of cross-contamination. They work on the principle of capillary electrophoresis, a technique for separating substances from a fluid substrate that does not entail the use of moving parts for pumping fluids. Battery powered, the chips enable users to perform analyses in less than a minute using a single drop of fluid. First, they separate molecules according to their charge/size ratio. Then, the molecules pass by a detector that measures their conductivity or fluorescent signal, resulting in a quantitative value. For single-use devices, capillary forces are a potential option because they are compact and energy efficient. But like Gray from Dolomite, Lelivelt believes that EOF pumping could be a viable alternative to using capillary forces. Employed in fuel cells, EOF pumps do not have moving parts, scale well, and can be powered by batteries or even cell phones. Other solutions, according to Lelivelt, include micromembrane pumps and disk-shaped microfluidic devices that use centrifugal forces to pump liquids.